Pentas plants come in both annual and perennial varieties. The perennial types are only hardy in U.S. Department of Agriculture hardiness zones 10 and 11, but they can be treated as annuals in cooler climates. Pentas grows at least 2 feet tall, producing lush, green foliage and clusters of red, pink, white or lavender star-shaped flowers. Whether grown as an annual or perennial, a Pentas plant provides summer-long flowering with proper care. Carefully remove the plant from the container and set it in the hole. Fill the hole half full with soil, then water it well to settle the soil and eliminate air pockets. Let the water drain, then fill the remainder of hole with soil and water thoroughly. 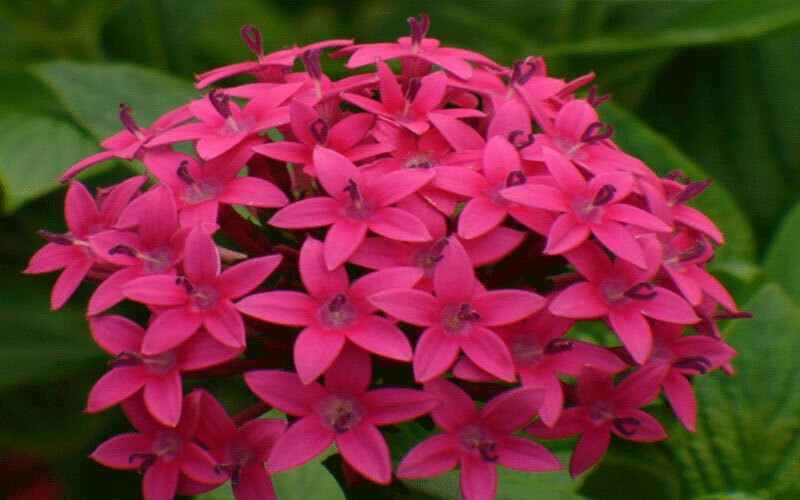 Plant Pentas in full sun or partial shade and well-drained soil. If you're planting more than one Pentas bush, leave 18 to 24 inches between each plant. Water Pentas when the top of the soil feels dry to the touch. Pentas are only moderately drought-tolerant and will need regular watering especially during hot, dry weather. Pinch the tips of Pentas stems often to encourage a bushy plant and continued blooming. Pinch the stem just above a leaf. Cut blooms as desired. When used in indoor bouquets, the blooms will last three to five days.